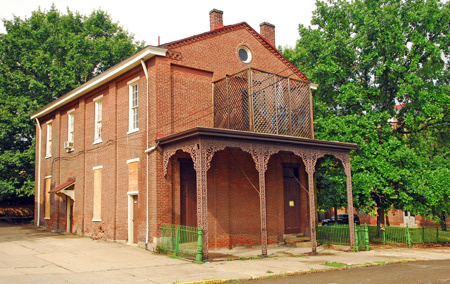 Pittsburgh’s Historic Review Commission will decide today whether a Lawrenceville structure slated for demolition should be recommended for designation as a local historic landmark. The former St. Mary’s Academy was built in the Greek Revival style in 1854 and used as a church and school in the 19th century, according to Lawrenceville architect Keith Cochran, who nominated the building for historic landmark status to prevent its demolition. Directors of the Catholic Cemeteries Association, which purchased the building and land from Our Lady of the Angels parish in 2005, want to tear down the building to create open land that eventually will be used for burial space as part of St. Mary Cemetery, Executive Director Annabelle McGannon said. If the commission decides the structure is a historic landmark, the nomination will advance to the city’s Planning Commission and to City Council for a final vote. Once designated as a local landmark, a building cannot undergo exterior changes, including demolition, without the city’s approval. Cochran said the building should be preserved because it’s one of the few of its style in the city. The Pittsburgh History & Landmarks Foundation, the Lawrenceville Historical Society and the Lawrenceville Stakeholders support his bid, he said. Designation as a historic landmark does not force the property owner to do any work on a building. The Catholic Cemeteries Association does not have the money to maintain the building and does not intend to preserve it or provide upkeep, McGannon said. The building has been vacant since 2004. Another larger structure on the site was built in 1874 for use as a church and will be preserved. The association plans to convert it into a mausoleum and a chapel where committal services will be held before burials, McGannon said. If the structure is not designated as a historic landmark, the association will apply for a demolition permit and raze the building within two weeks after the permit is obtained, McGannon said.